Calling modern cereal “the breakfast of champions” couldn’t be further from the truth. 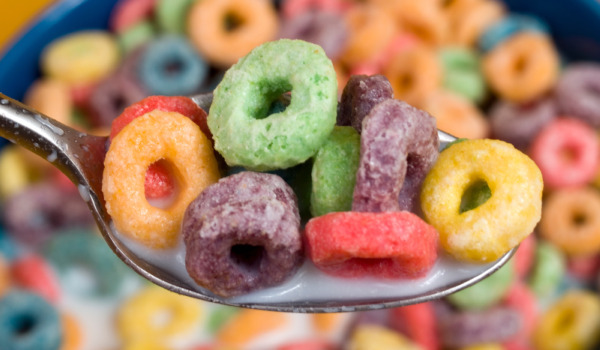 ALL boxed cereal is processed, even the organic ones, by a process called extrusion. The worst cold breakfast cereals contain extruded grains along with artificial colors, multiple forms of sugar, synthetic vitamins that our bodies don’t assimilate well, and plenty of starch to send our blood sugar and insulin levels skyrocketing. Before any cereal lovers become too depressed, keep reading for the healthy cereal alternatives at the end. Extrusion: What is it and why is it harmful? “Dry breakfast cereals are produced by a process called extrusion. Cereal makers first create a slurry of the grains and then put them in a machine called an extruder. The grains are forced out of a little hole at high temperature and pressure. Depending on the shape of the hole, the grains are made into little o’s, flakes, animal shapes, or shreds (as in Shredded Wheat or Triscuits), or they are puffed (as in puffed rice). A blade slices off each little flake or shape, which is then carried past a nozzle and sprayed with a coating of oil and sugar to seal off the cereal from the ravages of milk and to give it crunch. We are told there are no studies showing any difference between extruded versus non-extruded grains and the cereal industry seems to have convinced the FDA of this since there are no published studies, human or animal, on the subject. Group 1 was fed whole wheat, water, and vitamins & minerals. Group 2 was fed puffed (extruded) wheat, water, and the same vitamins & minerals as the first group. Group 3 was fed water and white sugar. Group 4 was fed water and vitamins & minerals. Results: The group that died off first was the puffed wheat group. Mind you, this study was the cereal company’s own study. (The whole wheat group lasted 1 year, the water and vitamin group lasted 8 weeks, the white sugar group lasted for a month…but the puffed wheat group died after only 2 weeks!). The early death these rats faced is unlikely caused by malnutrition since they died before the group of rats that didn’t receive any food. Group 3 was the control group and was fed rat chow. Results: The corn flake fed rats died of malnutrition BEFORE the cardboard box and water group. The rat chow group stayed in good health. Before they died, the corn flake group developed a host of dysfunctions associated with insulin shock (dysfunction of pancreas, liver and kidneys). 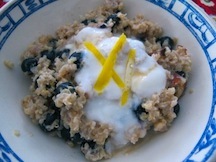 If you would like to avoid extruded grains and still enjoy cereal for breakfast. Here are two healthier alternatives. Soaked, whole grains of your choice. Soaking overnight with liquid whey and water reduces anti-nutrients and makes the grains more digestible. Soaked grains are still high in starch and carbohydrates. To reduce high blood sugar levels from grains, consume them with plenty of healthy fats such as coconut oil, pastured butter, raw milk, cream, nuts or seeds and some protein like a side of pastured egg, sausage or bacon. 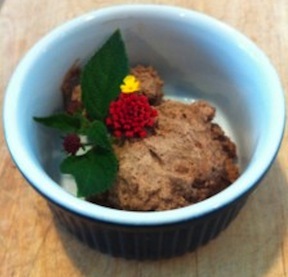 Make your own gluten-free, low carb cereal by combining coconut flakes, chia seeds, sunflower seeds, almonds (preferably soaked overnight with some sea salt) and goji berries in a bowl with raw cream and milk. Give the chia seeds a minute or two to expand and soften. 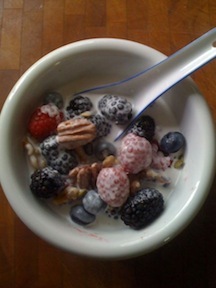 This cereal is delicious and the nuts, seeds and fruit can be varied for an equally delicious breakfast option. The Bay Area has plenty of health food stores and unprocessed food options. Shop the perimeter of the grocery store when you shop to help avoid processed, extruded purchases. No one can argue that cold boxed cereal is convenient. Similarly, no one can argue that poor health, illness, and disease are very inconvenient (to say the least). 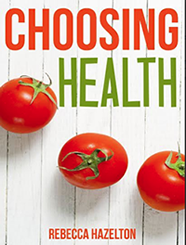 Make the effort to purchase and prepare foods that contribute to good health. Choose healthier grab-and-go foods such as nuts, seeds, jerky, canned wild fish, or fruit with nut butter. Eat leftovers, hot or cold. Health has many facets and the one we are going to focus on for the entire month of March is eating mindfully. Paying attention to each bite you take…no zoning out and shoveling food in your face, people! Tasting, savoring and appreciating the nourishment your food is giving you. Food is for nourishment, after all. Try not to use it as a substitution for not taking care of other areas of your life. Dealing with your emotions with your fork is a major form of self-sabotage. Slowing down and chewing completely. Thinking about the food you are eating and why you are eating it rather than thinking of what you are going to post on Facebook later, the errands you need to run, or the conversation you had the other day. If you think of all these other things, you enter a state of mindlessness about your eating and by the time you snap out of it, you will have eaten more than you needed to and probably not chewed your food very well. Make sense? Focus on your meal when you eat it and put your other thoughts on hold. Appreciate the food that is nourishing your body. If you are up for an extra challenge, make a food log so that you learn the patterns between what you eat and how you feel afterward in terms of fullness, energy level and ability to concentrate. It’s liberating. This challenge officially launches on March 1st, but there is no reason to wait. This isn’t a punishment: it’s an opportunity! Even the best diet and exercise plan goes out the window if we tune out our body’s signals for hunger and satiety. Thorough chewing plays a key role in digestion, nutrient absorption, and learning when enough is enough. It takes the brain about 20 minutes to register fullness after eating a meal. Chewing thoroughly slows eating down and allows the brain more time to realize you’ve had enough to eat. Digestion begins in the mouth with the salivary enzyme amylase. Chewing activates amylase and signals our other enzymes to get ready. Chewing breaks down food into smaller pieces, increasing efficiency of our digestive enzymes by creating more surface area on food particles for enzymes to attach. Some health professionals think thorough chewing reduces the risk of developing food intolerance. Mixing saliva and enzymes in the mouth with food makes it more recognizable. It also breaks down large protein molecules into smaller pieces that might otherwise pass through our intestinal barrier and into our bloodstream whole. Provides an opportunity for awareness. Eating can be hypnotic. People tend to tune out and disconnect from their mind-body connection when they eat. 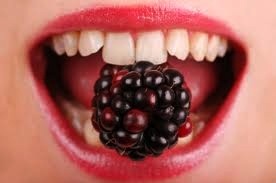 Paying attention to chewing food thoroughly brings attention to the process of nourishing your body. Don’t pick up another bite of food until you have chewed and swallowed your last bite. Chew your food until it’s liquid. Make food choices you would brag to your nutritionist about. Learn that food is for fueling, not a healthy means of changing your mood. Find a healthy substitute besides food to alter your mood (i.e. exercising, journaling, listening to music, going to the theater, reading). Chewing is a great way to encourage permanent weight loss. The better you get at slowing down and listening to your body while you eat, the more satisfied you’ll be with reasonable portions and the better you will get at registering fullness. 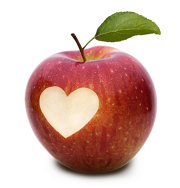 Show your health some love on Valentine’s Day. Instead of loading up on sugar, try some of these amazing lower sugar alternatives. Strawberries with chocolate whipped cream (heck, even plain strawberries are delicious and only 8 grams of carbs in 3.5 ounces~about 1/2 cup). Dark-chocolate dipped coconut, nuts or berries. If you choose a chocolate with high cocoa content to melt, the sugar ingested is minimal. Organic cheese platter with slices of pear or berries. Using sugar alternatives like xylitol, stevia, coconut sugar, and sucanat are beneficial for blood sugar balance, weight loss and maintenance, oral health, digestive health and the immune system. Is there such a thing as healthy ranch dressing? Yes. But you’ve got to make it yourself. Store bought dressings, even the organic ones, use vegetable oil as a base and vegetable oils are not heat or light stable. They turn rancid easily when they sit on store shelves and when we ingest them, we get all that nasty damaged oil, which contributes to cellular damage. Many dressings also contain refined sweeteners, corn syrup, artificial colors and flavor enhancers. No thanks! Making your own salad dressing is easier than you might think. Give it a try. It tastes SO much better than store bought and you’ll have the added reassurance that it contains only quality ingredients. Combine all the ingredients in a mason jar (or any jar with a wide enough mouth to insert an electric hand mixer) and whip it good, as Devo would say. Thats it. Here’s our awesome video. Take a taste. If you wish to add more spices or garlic, go for it. Some people prefer a mayonnaise flavor, so if that’s you, use a little more mayo and less sour cream. Really dang easy. 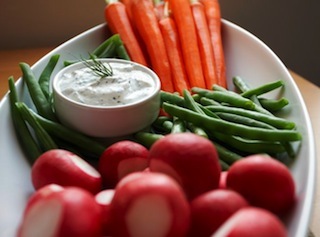 Enjoy on salad and all your favorite dipping foods.